March 9, 2015 | Dental Implants. Gösta Larsson received the first modern dental implant in 1965. At the time of his death in 2006, he had been using his implants for over 40 years! A modern dental implant is considered to be a titanium screw that when fused with your jawbone, creates a replacement root for a tooth. 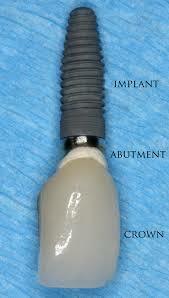 A dental crown is a prosthetic tooth that when attached to the implant looks and functions like a normal tooth. Just like a normal tooth can last forever, a dental implant may last forever. That’s not to say that a normal tooth or the dental implant will last forever, but with proper maintenance they should last a lifetime. Factors such as nutrition, hygiene, genetics, gum disease, trauma, or other diseases such as diabetes which can affect the bone are all contributing factors that may shorten the life of a dental implant. The crown will receive wear and tear over time, and this part needs to be replaced approximately every 10-15 years. To find out if dental implants are right for you, contact Davis Oral Surgery and Dental Implant Center in Raleigh, or call 919-488-2194 to schedule an evaluation. Why Do I Need a Bone Graft to Get Dental Implants?